If you are using macOS 10.14 Mojave, you must update version 2.9.11 or later of our apps. To check which version you have, launch the app and click in the application-name menu: About.... If you do not have version 2.9.11 or later, click the menu item Check for update…. Quit our app (BookMacster, Markster, Synkmark or Smarky). Click in the main menu:  > System Preferences. Select the pane Security & Privacy. In the lower left corner, click the padlock icon, enter your password and click Unlock. If the relevant app is not in the list, click the + button at the bottom of the list. A file navigation sheet will appear. Navigate into /Applications, select the app and click Open. 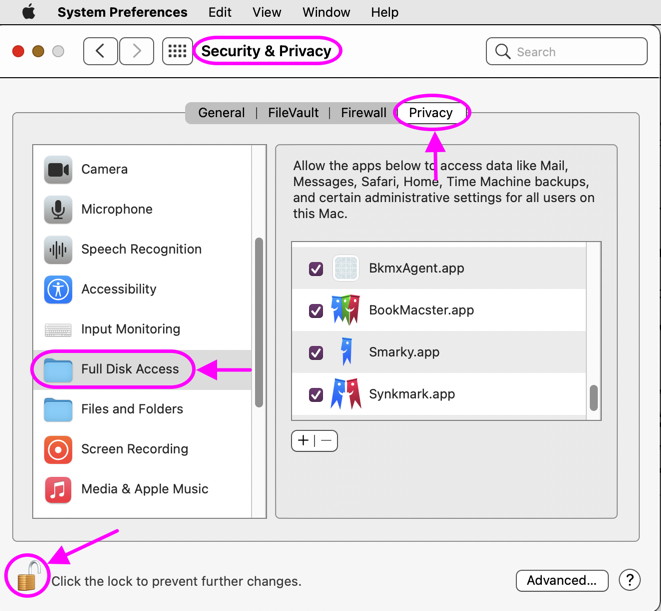 If BookMacster, Markster, Synkmark or Smarky are already in the list, click the app's checkbox once, to switch if OFF, and then again, to switch it back ON. This will re-authorize the current version and current installation of the app. We think this should never be necessary, but don't know for sure since Apple has not provided any documentation of how this works. Verify that the one app you selected is now in the list, and that its checkbox is switched ON. Notes: All three apps are shown above for illustration only. You should only be using one of our apps. Instead of all of the above, if you prefer, you may search the internet for "macOS disable System Integrity Protection SIP". But we don't recommend that.